Billmox (1 year ago) Inappropriate? Thebes (3 years ago) Inappropriate? Childe of Fyre (6 years ago) Inappropriate? ...and the silly thing double-posted on me. Grr. Sorry. Thank you again, for letting me know these were yours. =) And thank-you (now that I'm able to!) for making them available for us. They are lovely textures! manekineko (6 years ago) Inappropriate? siditty (6 years ago) Inappropriate? ad7ama (7 years ago) Inappropriate? Dialer (9 years ago) Inappropriate? Maxxy (9 years ago) Inappropriate? McGyver (10 years ago) Inappropriate? So cool! Thank you very much! AnIronButterfly (10 years ago) Inappropriate? Thanks! 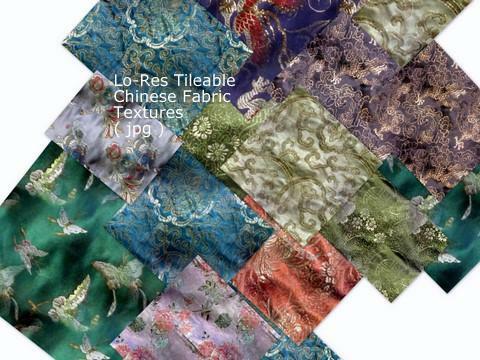 I've been needing some good Chinese fabrics! Thanks for posting these hon, they're just what I was looking for!